Child below 12 yrs old No extra bed &amp; sharing same room with parents is charged for 55%. Arrive in Yangon and transfer to your hotel. Meet your fellow travelers and Tour Leader (or local guide) for a drink and a welcome briefing. At Sagaing, visit a local nunnery and contribute food at the daily alms offering before joining the nuns for a delicious home-cooked lunch. Enjoy an excursion to U Bein Bridge – a 200-year-old teak bridge that spans over 1.2 kilometers and offers fabulous views of the surrounding farmlands and streams. Note: The cruise to Bagan on day 5 is subject to cancellation if river conditions are unfavorable. In the event that this cruise is cancelled, transport to Bagan will be by a flight and touring may be re-arranged. We had a great vacation in Myanmar in December 2017 as the tour was well organized and we were well taken care of. It was a pleasure working with the travel consultant did a fabulous job in customizing our trip. The tour guides (Mandalay, Bagan, Inle Lake and Yangon) were great source of information of the various sights that were visited. Special thanks go to our Mandalay guide, who we also went on a food tour with. We were introduced to the many good eats in Mandalay. We would heartily recommend our friends to use this agency for their trip to Myanmar. From the quotation to the pre-payment this travel agency provided excellent service during the preparation phase. The tours in Bagan, Mandalay and Yangon were excellent organised and scheduled. The guides were very competent and all come from the regions and love to present the wonderful country. Highly recommended! 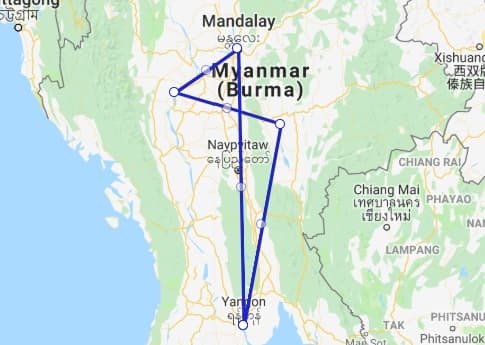 On the recommendation of friends we booked a similar bespoke 7 day tour, with a full guided day in Mandalay (2 nights), including the U Bein bridge and temples, travel by boat from Mandalay to Bagan, two full guided days in Bagan and Mt Popa (3 nights), and a full guided day in Yangon (2 nights), with temples and colonial architecture. It was all excellent, with knowledgeable guides and patient drivers, and all arrangements were exactly as arranged. Thanks to Lwin Lwin who made all the arrangements, very able and friendly. Tour was excellent value. We took 10-day tour in Myanmar with this company (Yangon-Mandalay-Bagan-Inle-Yangon). Starting from inquiry and ordering process, the company really shows professionalism. All questions are answered promptly and comprehensively. They also suggested several itin alternatives to suit our interests. And during the tour, they really take care of everything. When we got problem in our journey back from Inle to Yangon (our bus stuck in the hilly area in Shan State for 12 hours), the company tried everything to solve our problem. In short, you will never be wrong choosing this company as your travel agent in Myanmar. Travelled Mandalay I recommend this travel agency. Guider and driver are so nice and kindly. They are very polite and good service. Price is also reasonable.